Transcript of a meeting held at the offices of Blandshire County Council. Present: Councillor Gordon Scrote, chairman of Health and Safety committee; Inspector Robert Brent, Blandshire Police public order representative; and a large bearded Viking wearing furs, armour and a winged helmet, wielding a battleaxe, and bearing an uncanny resemblance to Brian Blessed in ‘Flash Gordon’. Viking (booming) – I AM THE GUIZER JARL! Councillor Scrote – Ah, yes, Mister Yarl. Now, we’re here to discuss your application for a public entertainment licence, but there are just one or two minor matters that we’d like to clarify. First of all, you seem to suggest holding what will be a relatively large outdoor event in January. With respect, Mister Yarl, that’s hardly a tourism-friendly time of year. Jarl – JANUARY! To salute the coming end of winter and honour the ancient Norse gods! Councillor G Scrote – So this festival has ancient origins, then, and reflects genuine Norse cultural heritage? Inspector Brent – So you can assure me that it wasn’t devised by a bunch of Victorians looking for an excuse for an all-night party and won’t include groups of men dressed as ballerinas and giraffes? Jarl (flustered) – Umm…look, Gordon’s alive! Councillor Gordon Scrote – Of course I am. (Councillor Scrote begins to cross through large sections of the form in front of him.) Now, Mister Yarl, the crux of the matter seems to be an unfortunate typographical error in your application. When you say ‘Fire Festival’, I presume you’ve omitted ‘works’ from the word ‘fireworks’, and that you really mean a carefully controlled fireworks display, with the public kept several hundred yards away behind barriers to fulfil Health and Safety requirements? Jarl (booming even more loudly) – NO! FIRE! Nearly a thousand men marching through the town bearing blazing torches! So close to the spectators that their cheeks will be warmed by the flames, and their expensive North Face kagools singed by cinders! 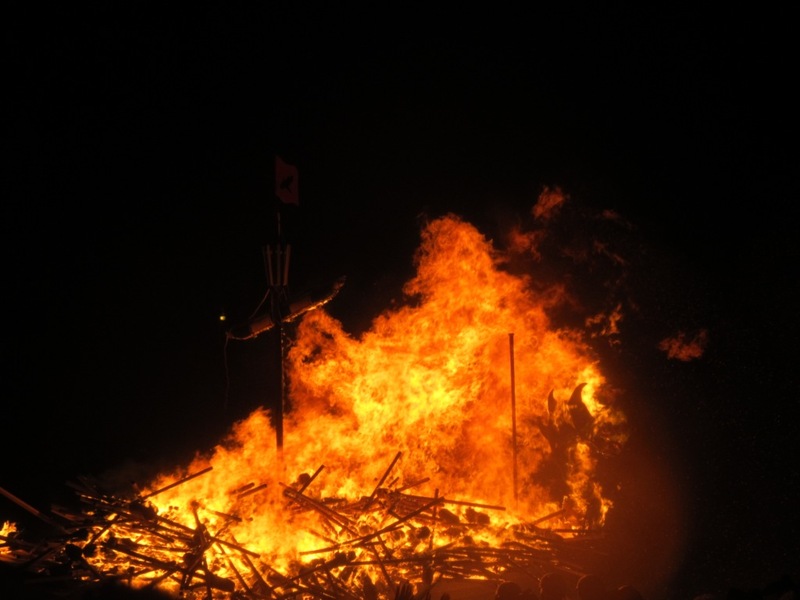 AND FINALLY, ALL THE TORCHES SHALL BE THROWN ONTO A VIKING LONGSHIP, WHICH WILL BE CONSUMED BY THE CLEANSING FIRE! Inspector Brent – I’m sorry, could you just run all of that past us again? 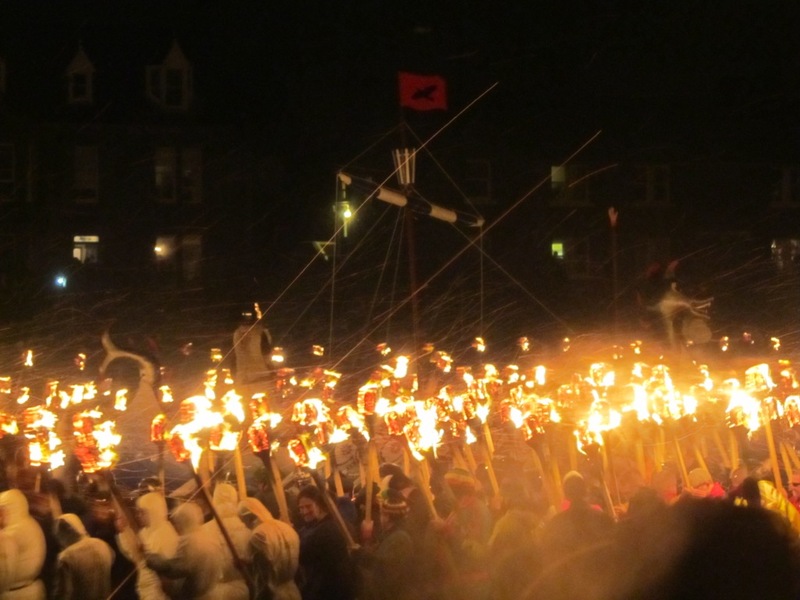 No, the Up Helly Aa parade in Lerwick, Shetland – Europe’s largest fire festival – would never, ever get off the ground if someone tried to start it today. Forget the fact that, like so many of Britain’s so-called historical traditions, it’s really an invention of the Victorian era which gradually acquired more and more accretions (the longship, the chief ‘guizer’ or performer known as the Jarl, etc), all of which are now set in stone. Something similar happened in my home village, which stages a spectacular Mayday festival – and despite the fact that May festivities have pagan origins, and that such celebrations in the village were recorded in 1563, the supposedly ‘traditional’ form of the annual event dates from only the 1880s. There’s another glorious example of this invention of ‘cod history’ on Shetland. The archipelago’s finest archaeological site is Jarlshof, which we visited before going to Up Helly Aa, but no inhabitant of any of the different settlements from different eras on the site would ever have known it by that name – which was a complete invention by Sir Walter Scott, who rechristened the real Sumburgh for dramatic effect in his novel The Pirate. Anyway, to return to Up Helly Aa (and I’d never realised that the Lerwick event is just the biggest of several that take place in communities around Shetland between January and March). Despite the very high winds – 84 MPH that night in Lerwick – and lashing rain, it proved to be one of the most astonishing things I’ve ever experienced. 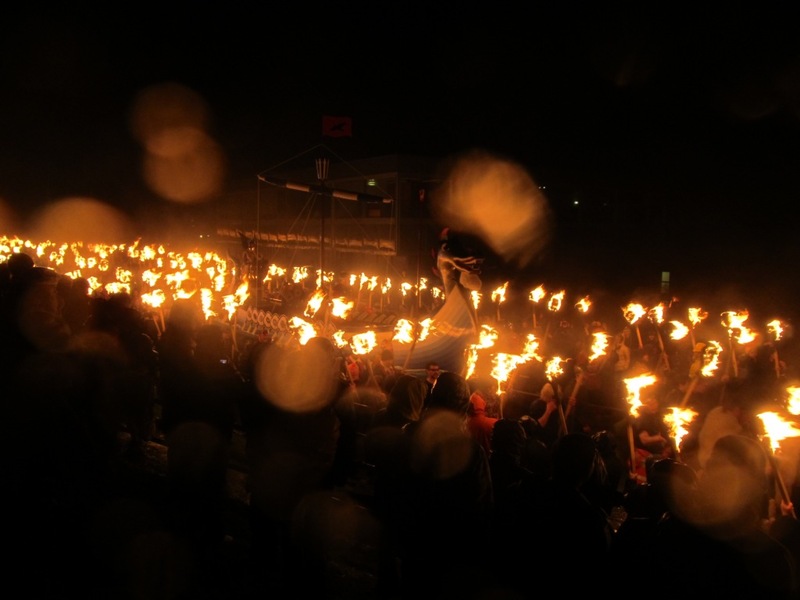 With the lights of the town extinguished, the procession resembles nothing less than a river of flame, and it’s easy to see why the primal power of fire has been regarded with such awe down the millennia. The camaraderie of the marchers and spectators was particularly marked; there were very few tourists present, hardly surprising given the difficulty of getting to and from Shetland in January and the prevailing weather conditions there at this time of year, and there was no sign of any anti-social behaviour. Whether that was still the case this morning in the dozen or so halls around Lerwick where drinking and dancing were meant to continue until 7 AM is another matter; we were in Lerwick at lunchtime and the place was remarkably quiet (unsurprisingly, the day after Up Helly Aa is a local bank holiday). 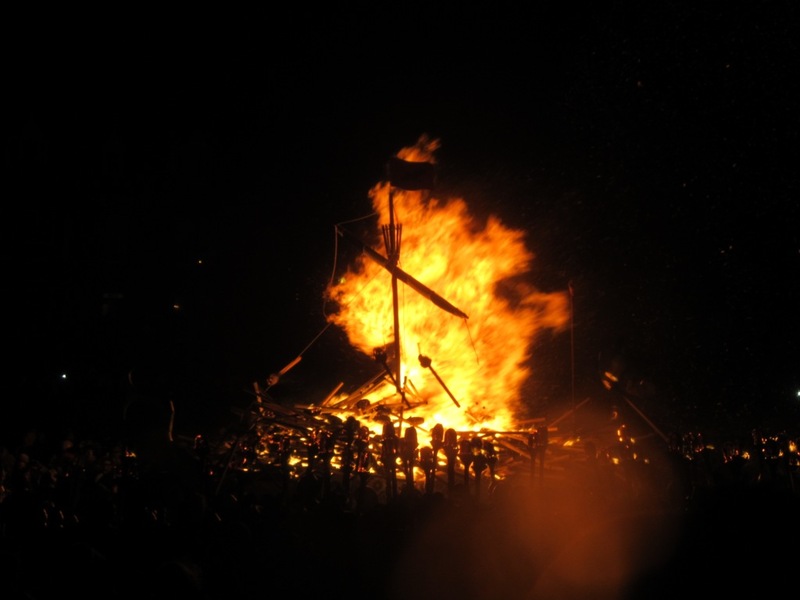 The climax of the event, the tossing of the blazing torches onto the longship, was a thrilling and unforgettable sight. But no words of mine are really adequate to describe it, so I’ll let the pictures (both mine and the BBC’s) speak for themselves!